Are you more of a visual learner? Check out our online video lectures and start your pulmonology course now for free! Interstitial lung diseases are part of the Restrictive Lung Disease category. Restrictive Lung Diseases can be extra-pulmonary, pleural or parenchymal. They all restrict lung expansion, with the result of a smaller lung volume available for breathing and air exchange. This causes increased work of breathing and impairs ventilation. A key indicator of Restrictive Lung Disease is a decreased forced expiratory volume in one second (FEV1) and forced vital capacity (FVC), with FVC being more affected than FEV1, giving a ratio higher than 80 %. Conversely, in obstructive Lung disease, such as COPD, the ratio is lower than 0.7, indicating an increased residual volume, a decreased FEV1 compared to FVC. In the lung parenchyma, Restrictive Lung Disease is characterized by interstitial lung fibrosis and in some conditions granulomatous formation. While the etiology of some of these diseases can be identified, the majority of the cases happen without an apparent cause. There are more than 200 different types of interstitial lung diseases. Idiopathic pulmonary fibrosis, historically known as idiopathic or cryptogenic fibrosing alveolitis, is a chronic and ultimately fatal disease characterized by a progressive decline in lung function. PF belongs to a large group of more than 200 lung diseases known as interstitial lung diseases (ILDs), characterized by the involvement of lung interstitium. In this group of conditions that includes fibrosing alveolitis and systemic sclerosis cause pulmonary fibrosis by continuous injury and repair of the lung tissue. The alveolar walls are usually thickened due to extracellular deposition of collagen and interstitial fibrosis. The prevalent theory is that the initial or repetitive injury in IPF occurs to the alveolar epithelial cells, or pneumocytes, which line the majority of the alveolar surface. When type I AECs are damaged or lost, it is thought that type II AECs undergo proliferation to cover the exposed basement membranes. They eventually die and the remaining cells spread and undergo a differentiation process to become type I AECs. Under pathologic conditions and in the presence of transforming growth factor beta (TGFβ), fibroblasts accumulate in these areas of damage and differentiate into myofibroblasts that secrete collagen. Secondary and primary pulmonary hypertension can also induce lung fibrosis. Lymphangioleiomyomatosis is a disease that only affects women and has been associated with smooth muscle cell hypertrophy, interstitial lung fibrosis and lung cystic formation. Granulomatous lung diseases are characterized by the formation of granulomas in the lung that consists of inflammatory cells infiltrates. Sarcoidosis, and chronic beryllium exposure cause granulomatous lung disease. Tuberculosis is an infective lung disease that is associated with lung granuloma formation. The exact prevalence of the different types of interstitial lung diseases is believed to be extremely low but the prevalence of the collective of the diseases is estimated to be 50 per 100,000. Occupational exposure to coal dust has been associated with pneumoconiosis, while exposure to beryllium might induce granulomatous lung disease. Asbestos exposure has also been linked to fibrosing lung disease. Other possible risk factors of interstitial lung disease include the use of amiodarone, radiation exposure, tobacco smoking, and gender in lymphangioleiomyomatosis. Lymphangioleiomyomatosis is a condition that can be found only in females especially those with tuberous sclerosis. Age is a very important non-modifiable risk factor for interstitial lung disease because these conditions are commonly found in the elderly. Patients affected by interstitial lung disease often suffer significant morbidity because the condition is progressive. Despite our current understanding of the pathogenesis of the condition, mortality remains high in interstitial lung diseases. While all interstitial lung diseases share the common end-point of continuous lung injury and repair that leads to fibrosis and/or granuloma formation, the exact first steps in the pathogenesis of the condition are different per the type of interstitial lung disease. Patients with this condition have chronic deposition of inflammatory cells that include macrophages and neutrophils in the lung’s interstitial tissue. Eventually, a vicious cycle starts where immune cells recruit more immune cells and tissue injury ensues. The inflammatory response in cryptogenic fibrosing alveolitis is believed to be the first step in the pathogenesis of the condition. The release of different cytokines, mostly Transforming Growth Factor Beta, (or TGF-beta) triggers cellular proliferation, fibroblast activation and the deposition of collagen and fibrosis. Exposure to dust and tobacco smoking are believed to be the first insult to the lung tissue which results in the accumulation of immune cells. Additionally, certain polymorphisms in the major histocompatibility complex genes have been linked to an increased risk of the disease, further emphasizing the role of the immune response in the pathogenesis of the condition. Systemic sclerosis is an autoimmune disease that is clearly linked to the major histocompatibility complex genes. Patients usually have serum antinuclear antibodies. Patients develop fibrosing alveolitis due to the activation of the immune system, the activation of the inflammatory response and continuous lung tissue injury and repair. Therefore, the pathogenesis seems similar to cryptogenic fibrosing alveolitis. Patients affected by this condition develop multiple lung cysts. Patients develop lymphatic vessels hyperplasia, smooth muscle cell proliferation and lung fibrosis. The condition is linked to tuberous sclerosis, another genetic disorder that is characterized by the formation of tubercula, which are believed to be related to an uncontrolled inflammatory response among other pathologic mechanisms. Activation and deposition of T-cells and mononuclear immune cells is the hallmark of sarcoidosis associated lung disease. Activated immune cells usually accumulate in a granuloma configuration. Sarcoidosis might have an infectious etiology as it has been linked to mycobacterium infection, but this finding remains debatable. Patients with interstitial lung diseases present with non-specific symptoms that include dyspnea, unexplained weight loss, fatigue and in some cases fever. Cough is another common symptom among these patients. Patients with systemic causes of interstitial lung disease such as systemic sclerosis or sarcoidosis can have symptoms related to the systemic illness. For example, patients with systemic sclerosis can develop cutaneous sclerosis, or difficulty swallowing while patients with sarcoidosis can present with joint pain. Occupational history is important in interstitial lung diseases as exposure to certain chemicals and dusts is known to increase the risk. Additionally, family history of the disease can be evident in some patients due to the previously discussed link between genetic and disease predisposition. Smoking history should be explored in patients with respiratory symptoms. Tuberous sclerosis is a systemic illness and patients can have epilepsy, cognitive impairment, and increased risk of malignancies in addition to their lung disease. Physical examination usually confirms the presence of troubled breathing and pulmonary function tests might show some impairment but imaging studies combined with histopathological examination remain the mainstay diagnostic tools for interstitial lung diseases. High resolution computed tomography is perhaps one of the most important investigations in the diagnostic work-up of patients presenting with interstitial lung disease. 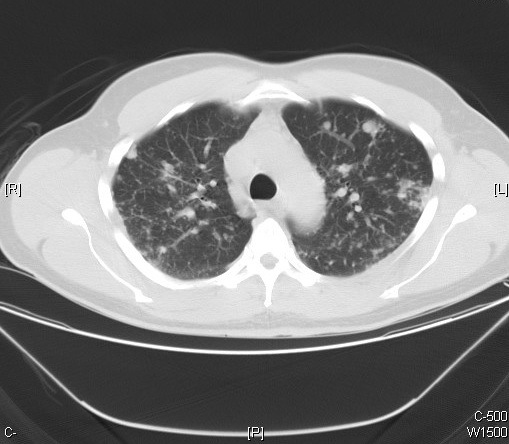 Patients have a picture that is consistent with idiopathic lung fibrosis, i.e. reticular pattern background with grown-glass appearance. If combined with histopathological examination of a lung biopsy, the diagnostic yield is usually good enough. 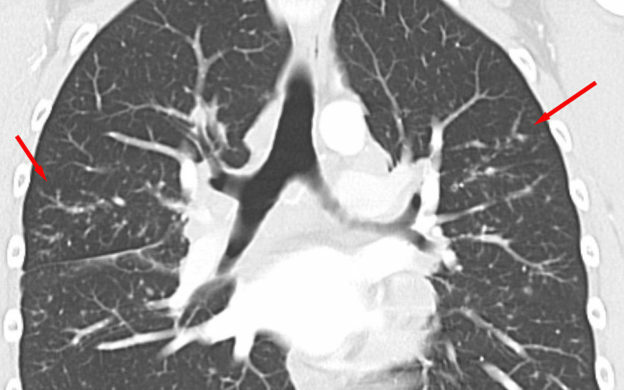 Patients might have a picture of either fibrosing alveolitis or granulomatous lung disease. Immune cell infiltrate, smooth muscle cell hyperplasia, and fibrosis are common in fibrosing alveolitis diseases. On the other hand, patients with granulomatous disease usually have lung granulomas that consist of multiple layers of activated T-cells and mononuclear cells. Serologic testing might be useful in case of systemic sclerosis. Autoantibodies are commonly identified and are believed to be related to the pathogenesis of the condition. Patients with anti-topoisomerase autoantibody are at risk of pulmonary fibrosis. Topoisomerases are enzymes that cut one of the two strands of double-stranded DNA, relax the strand, and reanneal the strand. Those with anti-centromere autoantibodies usually have limited cutaneous disease. Serum calcium and angiotensin-converting enzyme levels might be elevated in patients with sarcoidosis. Patients with a confirmed diagnosis of cryptogenic fibrosing alveolitis (Idiopathic pulmonary fibrosis) should be started on prednisolone 0.5 mg/kg and azathioprine 3 mg/kg for one month. After that, prednisolone dosage should be brought down to 10 mg per day slowly and continued for one year. Patients who fail to respond to medication or who have progressive lung disease are possible candidates for single lung transplantation. Patients with systemic sclerosis-related interstitial lung disease might benefit from cyclophosphamide. Pulmonary hypertension is a common complication in systemic sclerosis-related interstitial lung disease and should be treated promptly if encountered. Sildenafil, which acts by inhibiting cGMP-specific phosphodiesterase type 5 (phosphodiesterase 5, PDE5), an enzyme that promotes degradation of cGMP, and increases blood flow can be used for pulmonary hypertension in these patients. Patients with lymphangioleiomyomatosis benefit from sirolimus, which was found to decrease the rate of complications associated with the disease. Unfortunately, the response is usually short-lived. 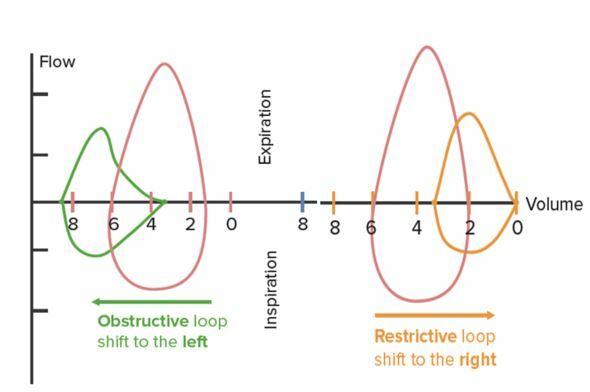 Patients with pleural effusions should undergo surgical obliteration of the pleural space because the recurrence rate is high after aspiration of the effusions. Those who develop hypoxemia should be started on supplemental oxygen therapy and if they are smokers should be encouraged to stop smoking. Lung transplantation is an option but patients should understand that disease recurrence in the transplanted lung has been reported in the range of 1—33 %, with sarcoidosis being the most frequently recurrent disease. Patients with sarcoidosis related lung disease usually respond to corticosteroids. Patients should be started on prednisone 40 mg/day which should be tapered down over six months and then maintained on 10 mg every other day for the rest of their lives. Patients who wish not to take prednisone or who are intolerable to steroids should take methotrexate. Cyclophosphamide is usually unsuccessful in the management of pulmonary disease in patients with sarcoidosis. Bourke, Stephen C. and Howell Clague. 2000. Review of Cryptogenic Fibrosing Alveolitis, Including Current Treatment Guidelines. Postgraduate Medical Journal 76(July 1999):618–24.